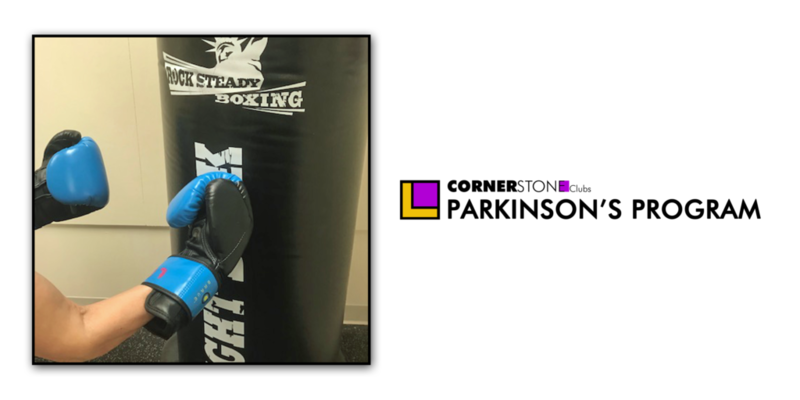 Editor’s note: It’s been about 6 months since we started the Parkinson’s Program at Cornerstone Clubs. At this point, we can safely say that’s it’s been a resounding success. We are thrilled to be able to provide this very important fitness service to an under-served population and felt it was time to start sharing some success stories. So, please read on and enjoy “Lightning’s” story. Everyone in the room chose a seat in a circle and waited quietly. The class started with introductions. First up – the coaches, “I’m Bart and I’m a Boxer. I’m Kristin and I’m a Boxer.” One by one, each participant introduced themselves following the lead of their coaches, not really believing their own words just yet. “1 – 2 – 3 -4! Jab! Cross! Hook! Hook!” Footwork was taught, punches were thrown, and when the final bell rang after 12 rounds of work, a feeling of major accomplishment filled the air. “BRING IT IN!” the coaches exclaimed. With hands joined together, a cheesy chant ending with “ROCK STEADY” sealed the deal. We had done it. The first workout was in the books. As for “Lightning”, she thought it would be her last. Lightning walked in and handed over her gloves. As coaches, we couldn’t let her quit. Not yet. See, we knew that Lightening was a fighter. We just needed a little more time to prove to her that she was a Boxer. After some conversation, she agreed to give it one more shot. And boy did she ever! “ Jab! Jab! Cross!” Lightening bobbed, weaved, and danced her way through the second class. At the end of the session, each boxer chose their fight name – “Jabbin’ Joe,” “The Stallion,” “The Hurricane.” Our fierce fighter, who almost walked away, chose “Lightning” because her punches became electric and her smile could light up the night’s sky (her coaches came up with the second part!). For more information about the Parkinson’s Program at Cornerstone, click here. Previous Previous post: Amy’s story proves that your 40’s can be a great decade!